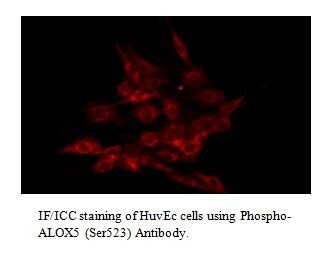 Phospho-ALOX5 (Ser523) Antibody| A1714 | BioVision, Inc. In phosphate buffered saline , pH 7.4, 150mM NaCl, 0.02% sodium azide and 50% glycerol. 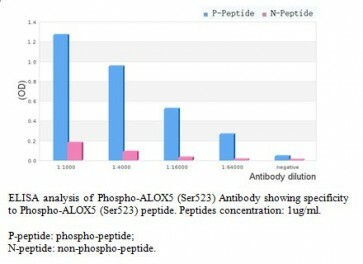 This gene encodes a member of the lipoxygenase gene family and plays a dual role in the synthesis of leukotrienes from arachidonic acid. 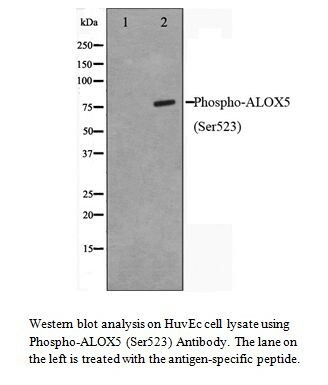 The encoded protein, which is expressed specifically in bone marrow-derived cells, catalyzes the conversion of arachidonic acid to 5(S)-hydroperoxy-6-trans-8,11,14-cis-eicosatetraenoic acid, and further to the allylic epoxide 5(S)-trans-7,9-trans-11,14-cis-eicosatetrenoic acid (leukotriene A4). Leukotrienes are important mediators of a number of inflammatory and allergic conditions. Mutations in the promoter region of this gene lead to a diminished response to antileukotriene drugs used in the treatment of asthma and may also be associated with atherosclerosis and several cancers. Alternatively spliced transcript variants have been observed, but their full-length nature has not been determined.